Belfast retailer dedicates window displays to ship-inspired designs. 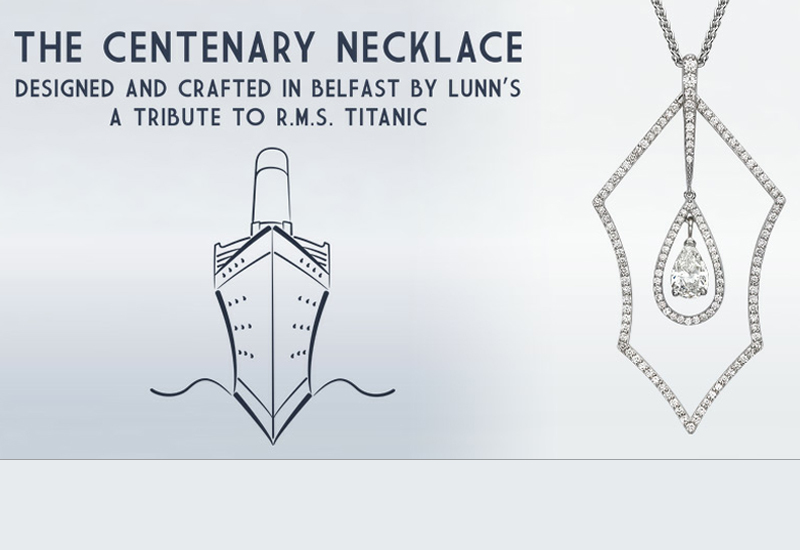 Independent jeweller Lunns in Belfast has marked the 100th anniversary of the Titanic, which was built in its home city, by creating a diamond pendant that pays homage to the ship. Lunns said that the necklace, which is inspired by the bow of the ship and the Art Deco stylings popular at the time of the ship’s voyage, has taken more than a year to create. The 18ct white gold and diamond necklace, which was designed in house at Lunns, has been made in two sizes. The larger size has the option of being set white or black diamonds with a white pear-shaped central diamond, while the smaller pendant is available with white diamonds and either a pear-shaped white diamond drop or a pear-shaped sapphire. Retail prices range from £2,950 to £17,500. Lunns has extended the Titanic theme to the window displays at its Queen’s Arcade store in Belfast with one window set up to show the pendants through portholes. It has also placed graphics of front views of the Titanic ships in the other windows. The jewellery launch flanks March’s opening of the Titanic Belfast, a nationally promoted exhibition centre dedicated to the historic ship in the city. The six-floor exhibit is housed in an ship-inspired building covered in 3,000 silver annodised aluminium shards that is located 100 yards from the exact spot the ship was put together by Belfast’s finest shipmakers.